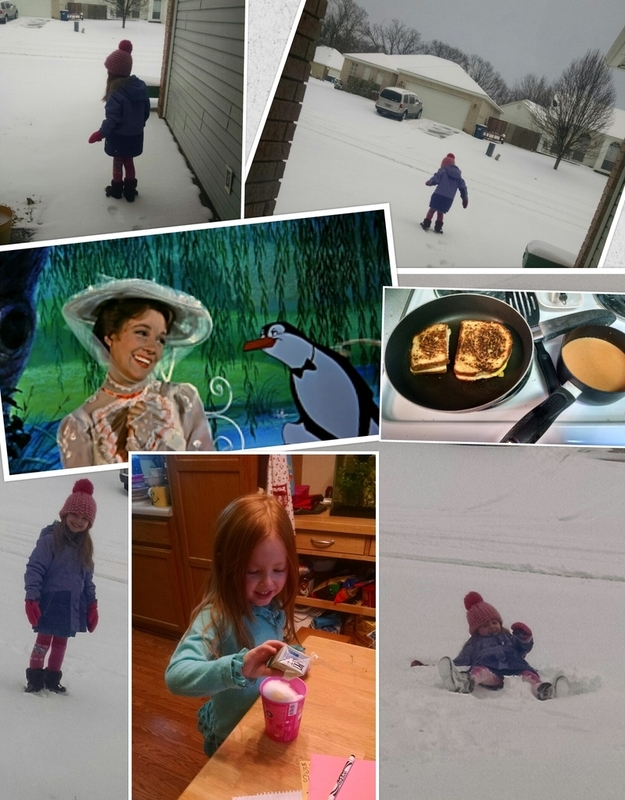 We're enjoying a fabulous February snow day, the first of the 2014-2015 school year. Aylin could hardly wait to get out into the snow. It was straight up 8am when she burst out the front door. Dressed with 2 pairs of leggings with a pair of knee high socks on top, and gloves that didn't stay on for very long. The squealing and giggling lasted pretty well the whole 30 minutes she spent out there. Then she had the bright idea to request a cup so she could fill it and make a Sno Cone. So once she warmed up enough in front of the fireplace she made a Sno Cone with her cup of snow and an apple juice box. To kill a bit of time and get my morning devotional in (that i usually wait to work on after she's off to school...) I turned her loose with craft supplies and she cut, glued, and glittered till her heart's content. Then, of course, the day called for grilled cheese and tomato soup for lunch. So now we're settled in, enjoying a bit of down time watching Mary Poppins!